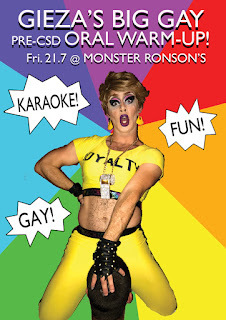 Monster Ronson's Ichiban Karaoke: HAPPY PRIDE!!! Haay haay haaaaaaaayyyy!! Ronson's is gettin' gaaaaaaaaaaaayyyy this weekend! For the tragically uninformed - this weekend is CSD, aka Christopher Street Day, aka PRIDE aka CELEBRATING LGBTQIA LOVE in the streets and celebrating all things queer and fierce, not unlike our very own Gieza Poke, who will be hosting a BIG, GAY, PRE-CSD ORAL WARM-UP PARTY THIS FRIDAY! QUEENS IN FULL FACE GET IN FOR FREE! If you're wondering what full face means, come check out THE HOUSE OF PRESEENTS on stage tonight (Tuesday). Pretty much any of those queens would get in for free. One poorly glued fake eyelash does not count as full face. And just a reminder that there are still TWO CHANCES LEFT to see LOVING THE ALIEN - THIS THURSDAY and NEXT THURSDAY! Don't miss this one, kids! It's seriously out of this world!! Get your tickets HERE or at the door at 19:00! DONNERSTAG 20.7.17 ab 19 Uhr - LOVING THE ALIEN! FREITAG 21.7.17 ab 22 Uhr -- GIEZA'S BIG GAY PRE-CSD ORAL WARM-UP! Let's get GAY! Queens in full face get in for free! HAPPY PRIDE! I FEEL SO GAY! DIENSTAG 25.7.17 ab 21 Uhr - THE HOUSE OF PRESENTS!